Stefan de Groot will give the final presentation of his MSc research Modelling the Dynamics of an Arc-Shaped Kite for Control Law Design on 11 May 2010. The presentation is open to the public and will take place at 14:00h in room B of the Aerospace Engineering Faculty of TU Delft. The need and interest for sustainable energy solutions is rising. A new branch in this field is high altitude wind power (HAWP). One novel concept is the Laddermill under development at the ASSET institute (TU Delft). The Laddermill uses kites to reel a tether from a drum which drives a generator. Currently, successful test have been conducted with leading edge inflatable or arc-shaped kites. Arc-shaped kites are extensively used and developed in the field of kite surfing. Due to their high traction and control capabilities arc-shaped kites are currently used for the Laddermill prototypes. One of the key factors for success is the ability to control kites automatically. Several potential control techniques exist to control a kite. These control techniques require fast kite models for online implementation. Kite models exist with specific applications. 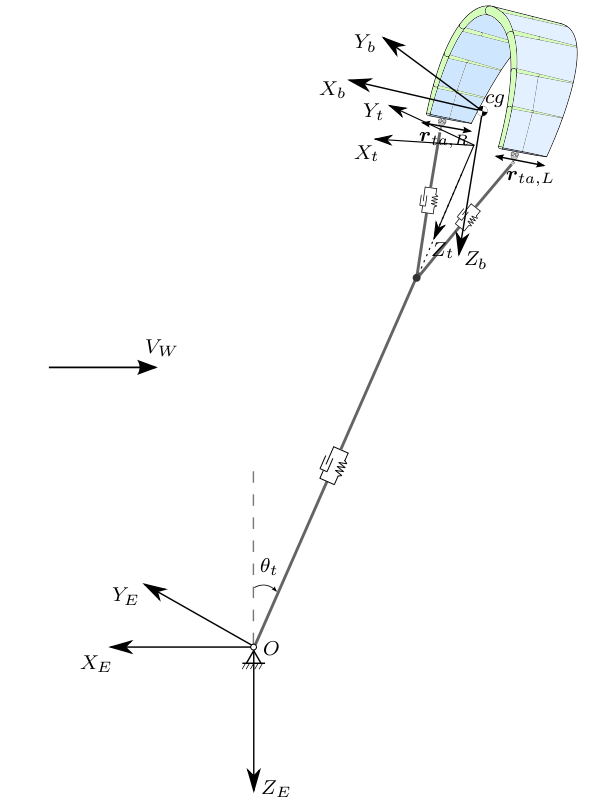 An example is the complex Multi-Body Kite model designed in the multi-body dynamics software application MSC. ADAMS. It is concluded that no kite model exists which satisfies the control requirements. A formal methodology is developed to reduce the Multi-Body Arc-shaped Kite model to a Rigid Body model. The Multi-Body model is reduced to a set of states describing the motion as a rigid body. System identification is used to derive the aerodynamic and structural model of the Rigid Body model from the Multi-Body model. Test simulations are performed to validate the Rigid Body model with respect to the Multi-Body model. The validation proves that the proposed methodology for model reduction is a qualitative manner for model reduction of the Multi-Body Kite model and for multi-body model reduction of flying objects in general. The Rigid Body simulates approximately ten times faster than real-time whereas the Multi-Body model is ten times slower than real-time.